A welcome mat to some of Austin's most inspirational homes! Have you ever walked through your neighborhood, taken a look at a weird house, and thought “Who lives there?” or, “What in the world does it look like inside?” We’ve all been curious, which is why the founders of the Weird Homes Tour™ began their strange and wonderful journey. Three years later, they’ve opened the doors and unlatched the windows of dozens of Texas’s strangest homes for thousands of onlookers. Why? To show that design really has no boundaries. And that we would rather neighbors be strange than be strangers. Like many other communities around the world, Austin can be fun, irreverent, outside the box, innovative, dynamic, proud, strange, and so much more. You just need to know where to look. 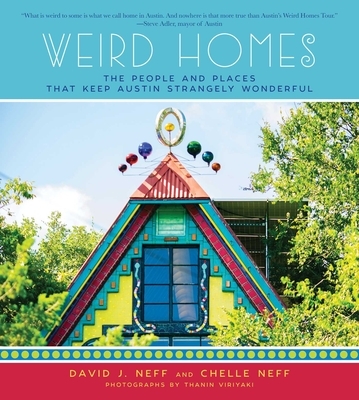 This gorgeous book features the one-of-a-kind Austin homes that started it all for the Weird Homes Tour. Page by page, we proudly present these homes and the weird people who live in them, many of whom designed and built their awe-inspiring dwellings by hand. From grand, historic haunts to treehouses and dumpster dwellings, you’re guaranteed to find something that will inspire design changes in your own home. David J. Neff and Chelle Neff share a love for interesting design, eye catching architecture, and all things weird and whimsical. These things brought the two together and are the driving force catapulting their Weird Homes Tour™ into new markets each year. By day, David is an author and digital strategy consultant and Chelle owns and operates Urban Betty Salon, an Austin beauty-scene institution. The Weird Homes Tour has not only given the couple a way to satisfy their own curiosity about what lurks inside the county’ s weirdest homes but it has given them a way to give back to the communities that are home to these iconic treasures as each tour donates a percentage of its sales to local affordable housing nonprofits. Thanin Viriyaki came from Bangkok, Thailand, at a very early age to settle in Texas and become an American. Though in his youth he wished to become a transformer, his strong interest in art eventually led him to pick up a camera. He always had piles of photographs covering his bedroom floor; the family camera became his tool to record inspirations for his drawings and paintings and eventually led him to take up photography for his major at the University of North Texas. Since then he's become an internationally known photographer around people, places, and food. "Filled to the brim with colorful photos, [this book] takes you into the homes you thought only existed in dreams." —Texas Standard"